Audio is pretty good for the easiness of you presentation atmosphere, and a short video can help illustrate a key point or support an argument in a presentation. When starting your creation, don't forget both of these media elements. In the Animiz, you are very convenient to make such a presentation filled with any type of audio and video as you like. It allows you to embed local video to enrich the content, and add music to every scene by yourself. Even you are given the ability to cut the inserted audio and adjust the music volume with ease. Of course, you are able to add background music to improve your whole presentation work. Don't miss the importance of an introduction with text if you want to make a clear and engaging video presentation. 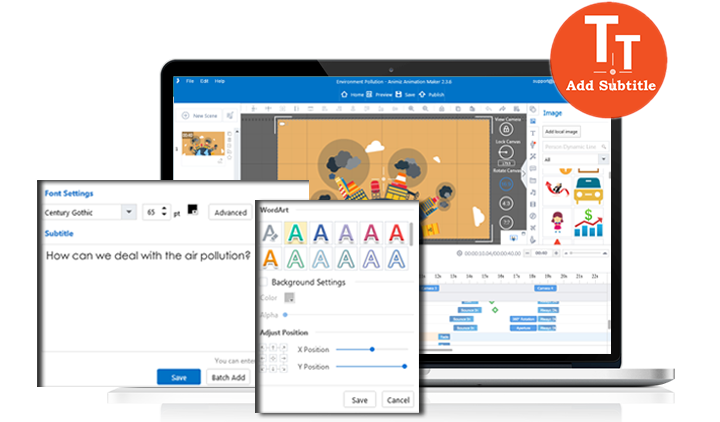 But with Animiz animated video maker, you can directly add caption with its fantastic subtitle editor. It can not only help you go straightforward to add subtitle, but also customize the font setting. Even you have the option to make advanced settings about WordArt, background and position of the caption. Whether you want to introduce the content in the scene or state steps for your operation, it can meet all your needs. If you want to produce an anmation video presentation for YouTube, you should go ahead to publish it after finishing the editing of your video project. Video presentation designed by Animiz is available for online and offline viewing, and there are different publishing formats to make it possible: Publish to Cloud, Video and Gif. Here both the Cloud and Video publishing formats can help you easily share your video presentation on YouTube. 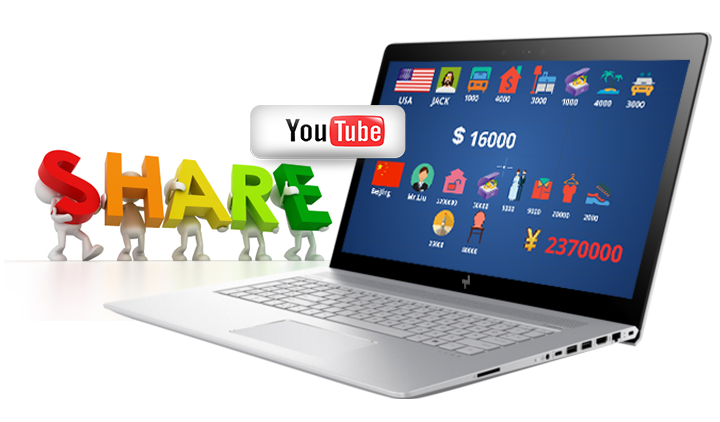 You are allowed to share your created video presentations on social networking website like YouTube. You can choose to publish your work to the Animiz online platform first, and then share the link or the QR code to YouTube to make it reachable for more people. Or you can publish your presentation work into video, and then upload it to YouTube social services from the local file. There is no code and the third part application required in the whole operation. Everyone can make it in minutes. Create a video presentation with online template or start from new empty project. Embed audios and videos to decorate the content and improve your presentation. Add subtitle to give an introduction about your content or operation steps. Choose one distributing channel to make it viewable online or offline. Publish your work to the Cloud or into video to make it sharable on YouTube.